These unique myGodTags™ are a non-traditional take on standard military issued dog tags. Each myGodTag™ was created from an original drawing or piece of artwork. Then it was made into a stamp, which was then used to create an impression in wax, and later cast into a sterling silver tag. These solid sterling silver tags are handmade in Texas. Each tag comes with an adjustable leather cord (shown in middle of photo). The tags come with a card that shows the symbol and its meaning, and the scripture reference. 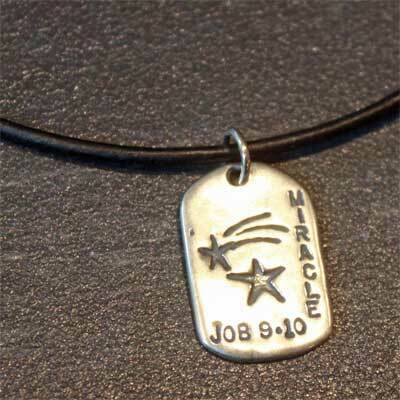 A second tag (Sold Separately) can be custom stamped with names, dates, special messages or scripture references. See separate products below: Customized God Tag - Small; Customized God Tag - Medium; Customized God Tag - Large. Sterling silver ball chain (shown on right) and rolo chains (shown on left) are sold separately. MIRACLE: If you look around in everything you see, from the smallest living creatures to those who survive the un-survivable, you will find an unexplained occurrence that can only be explained by a miracle.